On Tuesday, December 4th, a group of MTA Sophomores joined Yeshiva University’s Political Action Committee on a trip to Washington, DC to lobby Congress. Over the course of the day, they met with members of the House of Representatives to discuss the importance of America’s continued support for Israel as well as the many security threats and challenges that Israel faces. 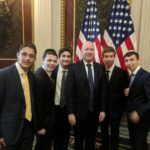 Afterwards, they had the opportunity to explore Capitol Hill and tour the White House, where they heard from Special Representative for International Negotiations and MTA alum Jason Greenblatt (‘85), as well as other administration officials. After davening Mincha, the talmidim enjoyed dinner and Maariv at AIPAC headquarters before heading home.